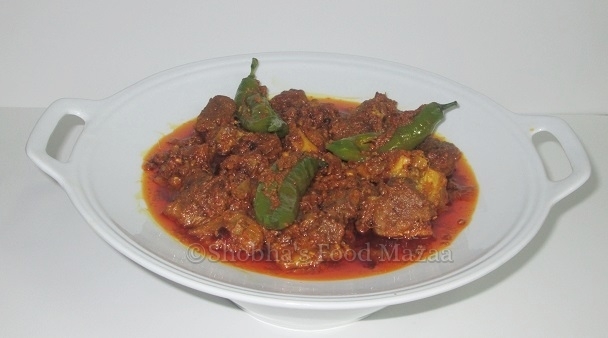 Achari gosht is a spicy and tangy meat dish cooked with pickled spices. It is a treat for those who love spicy food.Traditionally mustard oil is used for the preparation of this dish which gives it a distinct pickle flavour. 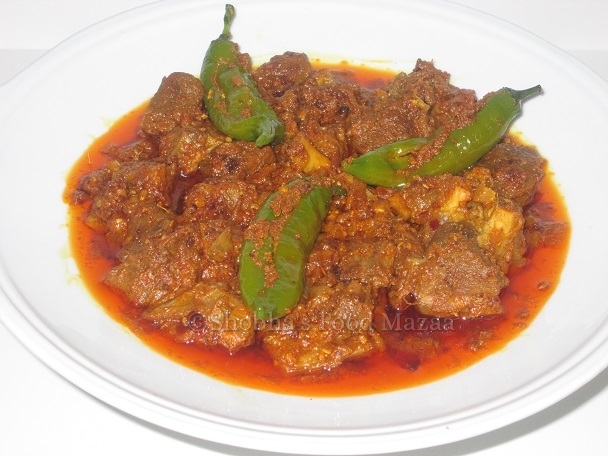 You get the best results when the meat is slow cooked after marination with yogurt and pickle spice mix. This can be done if the meat is very tender. Unfortunately the meat we get here in Brazil is very hard and takes a long time to cook. So I have used the pressure cooker to cook until the mutton is three-fourths done and then added to the rest of the ingredients and allowed it to simmer until done. 1.Clean the mutton and boil until three fourths done in a pressure cooker. Add some whole spices like black cardamom, cloves, cinnamon,bay leaves and a little salt. Discard the whole spices after done. 2.Slit the green chillies and remove the seeds. Take one tbsp of the achari masala and add a little salt and a spoonful of lemon juice. 3.Stuff the green chillies with it and set aside. 4.Mix the remaining achari masala with the yogurt. 5.Heat oil in a pan and saute the onions until translucent. 6.Tip in the ginger garlic pastes. 7.Now add the tomato paste along with turmeric powder, chilli powder, coriander powder and a little salt. 8.Stir in the yogurt with the achari masala. 9. Continue stirring to avoid it from curdling. 10.Now add the meat pieces and mix well. If any stock is left you can add a little if needed.Check the salt and add if required. Simmer it until almost done. 11.Finally at the finishing stage place the stuffed green chillies on top and cover with a lid. Do not stir. 12. The chillies will be done in 3-4 minutes. They should remain firm and crunchy. Do not over cook them. 13. Garnish them on the meat while serving. 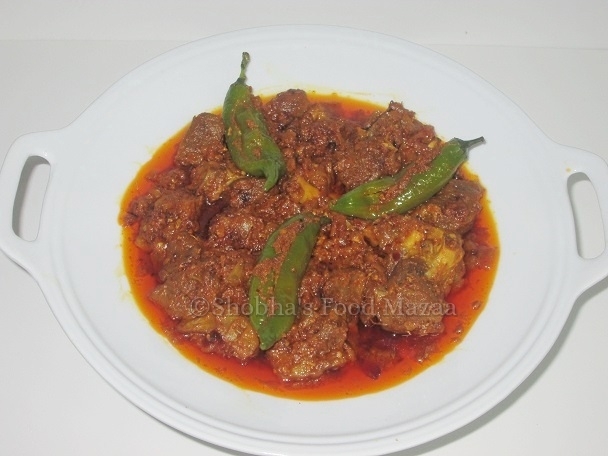 The achari masala must give this curry a delicious taste. Mutton curry with pickle masala looks really yumm.